Interest in Colorado Caucus and Iowa Caucus peak in presidential election years. April 8 rancher Kimmi Lewis was nominated from the floor of the Colorado House District 64 Republican Nominating Assembly, which also nominated Tim Dore for what would be his 3rd term. A surprise nomination like this often happens when an elected representative looses contact with those who have put them in office. Lewis got more votes that Dore, which usually is not the case for a challenger, and if you Google Kimmi Lewis you can see she is getting overwhelming support from her local community. It is very likely Tim Dore is running a stealth campaign with telephone calls and direct mail to supporters. Being the incumbent it is very likely he will be reelected WITHOUT YOUR HELP. Dore was a Democrat until deciding to serve District 64, which is heavily Republican and Dore realized it is very unlikely a Democrat could win. So fresh from this shock at his Republican assembly, Dore was the "Republican" sponsor of legislation that would have killed our Colorado Caucus, which kills this kind of challenge. your registration from Unaffiliated to Republican. Colorado Caucus! Only some 20% of registered voters have cast their ballots. 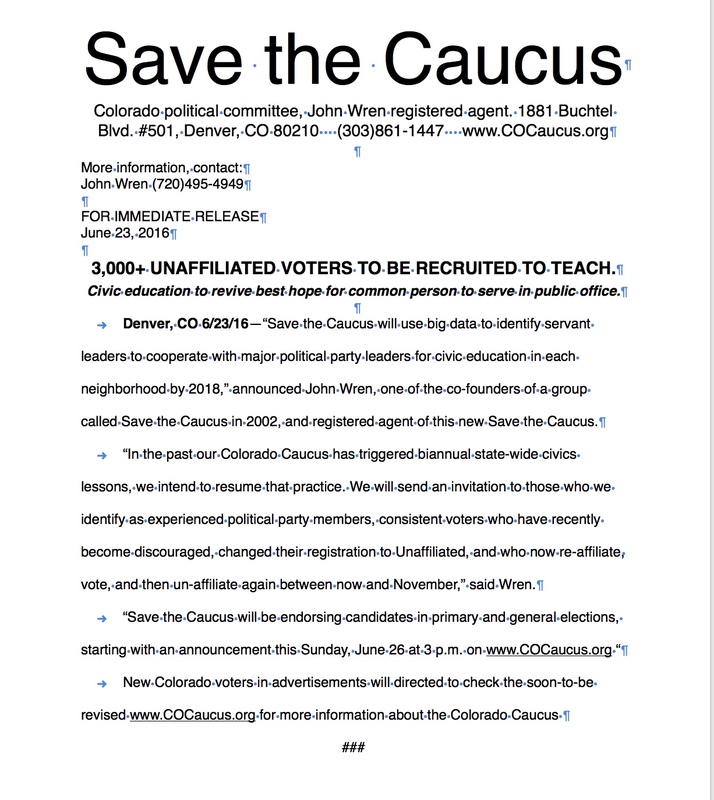 Why save the Colorado Caucus? Colorado Caucus-- where the voice of the common person makes a real difference. If the Empire, in StarWars terms, fools enough people, our wonderful Coloradan grassroots will once again be replaced with the astroturf of a Presidential Primary. This is not a new fight. Wren recently reactivated Save the Caucus with the Colorado Secretary of State and listed himself as registered agent. “Our intention was to be ready if a ballot initiative arose that would have the same impact as Amendment 29 in 2002, and that has now happened, and we could be taken back 100 years to the corruption that existed then that finally stopped with the progressive reforms adopted by states across the country," said Wren. At each neighborhood caucus, members of one of the major political parties vote for delegates to their county assembly. At the caucus and assembly citizens have the chance to persuade their neighbors about why their preferred candidate should be elected. A candidate must garner a minimum number of votes to be presented at the next level. At the county assemblies, some of those delegates will be chosen to go to the seven congressional district assemblies and others to represent the candidate at the state assembly. From there, delegates are chosen for the national convention, where they will have a chance to choose their political party’s nominee for President of the United States of America. Cost of Presidential Primary— $Millions. The experience of shared humanity lost— Priceless. That is why it is so important that we once again Save the Caucus. Support candidates who support the Colorado Caucus. Endorsements for Colorado primary will be announced here at 3 p.m. Powerful forces attack Colorado Caucus again. "John S. Wren of the group Save the Caucus said party leaders don’t like the caucus because it puts rank-and-file members more in charge than the leadership. He gave a brief history of Colorado caucus. “It’s consistently been under attack by powerful forces almost since its inception,” he said. Denver Post Corrects Print Edition Story. From now until the elections Save the Caucus will make a media release each Sunday afternoon at 3 p.m. and post it here on www.COCaucus.org. PLEASE FORWARD. THANKS! If you can't open the release or if you want more information about it, please call John Wren, (303)861-1447. Thanks! Colorado Capitol Saturday (6/11), stop drive by voting! Don't let them AstroTurf our wonderful Colorado grassroots with the drive by voting of an expensive, meaningless so-called Presidential Primary. We are trying something this morning at 10 a.m., RTD University Station here in Denver. Weekly Donut Club meeting. Social event. Join us if you can! We'll let you know how it goes. Join us, Save the Caucus! Startup Show, noon MDT or by recording here sponsored by Small Business Chamber of Commerce, Inc. Each Friday we talk about startup. Today the start of "Caucus Corp."
To be on the show next week call John Wren on Monday or Tuesday at (303)861-1447 or RSVP for next week's show on http://www.Meetup.com/Small-Biz-Chamber where you'll also find information about the IDEA Cafe Startup Workshop and joining a peer advisory group. PLEASE CARE ENOUGH TO SHARE THIS WITH A FRIEND. THANKS! Today at Noon on the Startup Show : Thanks Villager Newspaper! Topic of Startup Show today (Fri, 6/3) at Noon, link will be posted here. 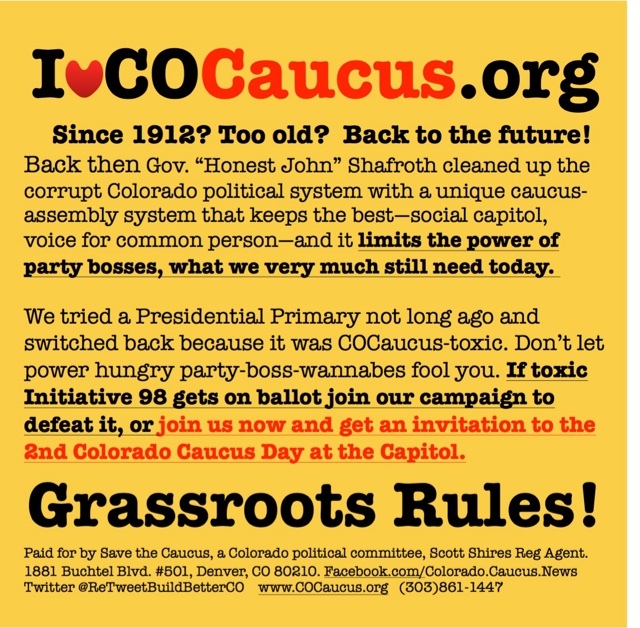 For now, read all about it on this link, why a network of hyper-local political educators and mentors is in the works to save our wonderful Colorado Caucus. Check it out now, then come back at noon today or any time over the weekend. Here's the article: GrassrootsRules.us : Thanks Villager Newspaper! : "Thanks to Bob and Gerri Sweeney and everyone at the Villager Newspaper for this article this week that is a direct communication to the most..." click above to read it all. I can't do this alone. We need all kinds of help. Call me if you'd like to be part of what we are doing to Save the Caucus. Thanks!